My last race for 2013 was a Thanksgiving gobble jog. I love my Gobble Jog shirts! I ran this race last year for the first time with hubby. In 2012, we took the kidos with us. Michael ran the 10k (his first), and the plan was I would run the turkey trot (1mile) with the kidos in our new double jogging stroller. If you want to read about how all that went, click here to read the old post. It was a cold run last year, but this year, it was record breaking cold! Thankfully (hehe, Thanksgiving day, get it?) we had decided to drop the kids at Nonna's and Poppa's before running. This year, Michael did the 10k again - and had an even better time - and I ran the 5k (love my 5ks). 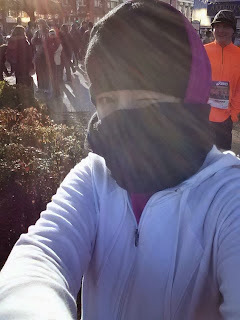 I felt like a running ninja! My time on my Nike app was 34 mins; official race time said 35 mins. I'm going to stick with my Nike app and say I ran it in 34. ;-) Running in the cold with layers of clothing on you and your bones screaming for warmth as they creak onward is HARD. My race times in the winter are always bad. 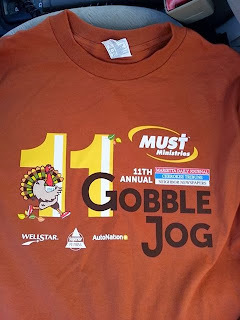 But, love of running - and of food - inspired me, so I'm glad I decided to run another gobble jog. Today's forget-me-not: Do that which you love - often. And be thankful for it!